Manometer is an instrument to measure the difference in the pressure of gases or liquids. It is a U-shaped glass tube containing liquid inside. Liquid can be any type, but usually mercury, oil or water. Mercury is the best as it is the densest liquid. Only atmospheric pressure Po acts on both the surfaces of liquid at A and B as they are open to air. Thus, liquid settles at common level at A and B as pressure exerting at A and B is the same. (a) Pressure due to gas supply, PA at A is higher than the atmospheric pressure, Po at B (open arm). Liquid level at A (being pushed downwards by higher gas pressure) is lower than that at B to cause a height difference of h, which is proportional to the pressure difference between two arms. When the liquid settles (at equilibrium), the pressure at A and C must be the same as they are at same liquid level. (b) Pressure due to gas supply, PA at A is lower than the atmospheric pressure, Po at B (open arm). 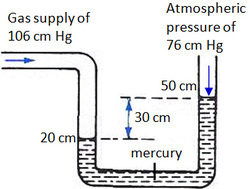 Liquid level at A is higher than that at B (being pushed downwards by higher atmospheric pressure) to cause a height difference of h, which is proportional to the pressure difference between two arms. When the liquid settles (at equilibrium), the pressure at B and C must be the same as they are at same liquid level. The arm with higher pressure has lower liquid level as compared to another arm. Height difference is caused by the pressure difference between both arms. Given any point on an imaginary horizontal line drawn from the meniscus at the lower liquid level arm, the liquid pressure is the same. Pressure at any point on a liquid is the pressure of everything acting on top of it. Always remember to include atmospheric pressure when there is an open arm! When there is a change in the pressure (better express it in cmHg) for one arm, do remember each arm changes its liquid level by only half of the change in height associated with the change in pressure. Initially, the liquid level is settled as shown. These two liquids must not mix with each other. If no, it cannot work. Look for the level where they have same pressure. It is always at the bottom of less dense liquid. Less dense liquid is always on top of denser liquid. We wont have a manometer like that one shown in the diagram (b) as denser liquid should sink down to the bottom. A U-tube with 30 cm of water is set up vertically and 12 cm of oil is poured carefully into the left hand limb of the tube. It is observed that water will be pushed up in the other limb. The density of water and oil are 1000 kg/m^(3) and 920 kg/m^(3). What is the length of the water column above point A?